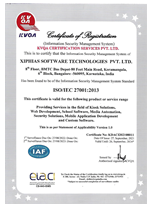 In its brief stint, XIPHIAS has emerged as a leading professional website designing company in India. We offer website designing & development services, e-commerce web designing and graphics designing services best suitable to your budget. We offer a full-circle approach in website design & development with focus on understanding our client’s business objectives, resolving the problem areas and finally designing the best possible solution. You can outsource you website designing & development task to us and be rest assured that we will provide the most attractive, user-firendly and comprehensive solution. Our web designers can create absorbing and elegant web graphics for your website. We add our creative touch to make your site an attractive, pleasing and eye catching introduction to your customers. Our company's web programming unit provides custom web development services at any level of complexity. Whether it is a basic requirement contact form or a complicated on-line program, our expert developers can code at all levels to create what you require. XIPHIAS offers a wide range of E-Commerce solutions for organizations that have moved all, or a segment of their financial transactions online. Our comprehensive E-Commerce solutions enable transactions such as ordering, fulfillment, invoicing, and payments to be executed securely online. The most effective way to make your web site a good selling tool is to optimize it for a better search engine placement. In today's date, search engines set is the main source of getting new customers and our dedicated SEO team provides you with search engine optimization and search engine submission services. These services help in directing traffic to your site by increasing visiblity and thereby help in generating more sales. XIPHIAS alo delivers full range of Internet Marketing services - from developing and implementing an online marketing strategy to evaluating and tracking results - to ensure that your website stands out from the crowd. Every company needs a unique identity and a logo defines it the best. We design your logo, business cards and other corporate ID items (such as corporate folders, letterheads and envelopes) in a creative and unique manner so that they are well-recognized by the web audience and your customers can recollect your image identity easily. We provide comprehensive, accurate, and quick web site maintenance services. A well maintained and updated website is very important to attract customers. If the site contains out-dated information or links that do not work, customers are less likely to inquire for your products or services. We are committed to provide high quality, economical and time efficent software development services. As a company involved in software development, we are always working with cutting edge tools and technologies, keeping in mind the current trends and also an eye on the future. We are geared to handle every stage of the development process right from problem definition through testing/debugging. Everyday, more and more people are deciding to move away from making paper catalogues and brochures and are choosing to use CD-ROM's and Digital Business Cards to promote or illustrate themselves and/or their company in the digital world. This medium is generally referred to as a Multimedia Presentation and we expertise in providing your company a face and more visibility on any digital platform. 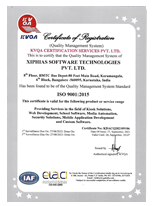 XIPHIAS has been at the forefront of the Internet revolution in India. Its Internet Presence Division provides web site hosting and application web hosting services. It sells web space and dedicated Windows 2K Web Hosting and Linux Web Hosting. It has outperformed the Dot Com industry in revenue growth and profitability because of its strong commitment towards understanding and fulfilling rapidly changing customer expectations.